Emma Lucas brought home first place at the state history day competition and is set to compete against national students in June. DELAWARE, Ohio — One River Valley Middle School student has done and gone where no student from River Valley Middle School has before. Emma Lucas, a seventh grader, earned first place at the Ohio State History Day at Ohio Wesleyan University. Part of the appeal of Lucas’ project was its subject: the American Electric Power (AEP) buyout of the village of Cheshire. Lucas’ grandfather Scotty Lucas was the mayor of Cheshire and still resides in the village. Emma relied on her grandfather as a source as well as other news articles from the time. The buyout took place in 2001 and affected the village of Cheshire, where much of Lucas’ family is from, giving her a close perspective of that moment in history. Her family helped her compile research and interviews on the project, making it a family affair. Lucas had to do the project for the county academic fair, but chose to continue on at the regional history day in Chillicothe, advancing to the state level. At each level Lucas’ exhibit was judged and she was asked questions regarding her research and process. Lisa Ritchie, the librarian at the middle school, helped Lucas with her project. “Emma is the first exhibit we’ve ever had go at the middle school. We’ve had many performances go, but she is our first exhibit. 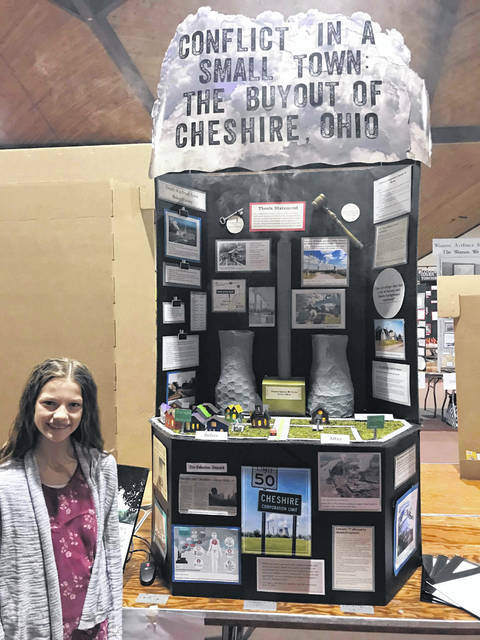 It is very hard for an exhibit to go on from state to nationals, and she is up against a lot of big schools, so she must have charmed the judges a little more than she is letting on,” said Ritchie. From the county school district, four performances and two exhibits went to the state level, but Lucas is the only to continue on as a national finalist. She will compete in June in Maryland against other students from across the country.